YOU GET A NICE DOSE OF HISTORY AND 3 SIPS OF WHISKY for your $8 on a typical Saturday afternoon between 2:30 and 5:30, in Building 121, the old Paymaster quarters at the Brooklyn Navy Yards. 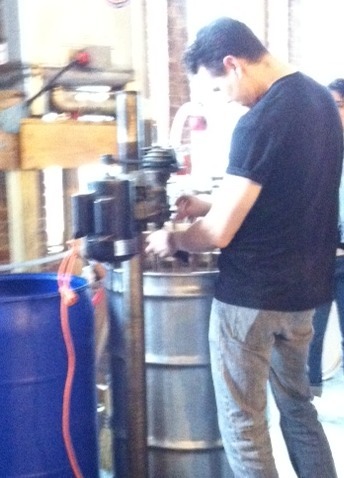 Brooklyn Artisan took the tour on Sunday, a special opening for the distillery’s participation in Open House New York. The Boozeum displays a home-size copper distiller. 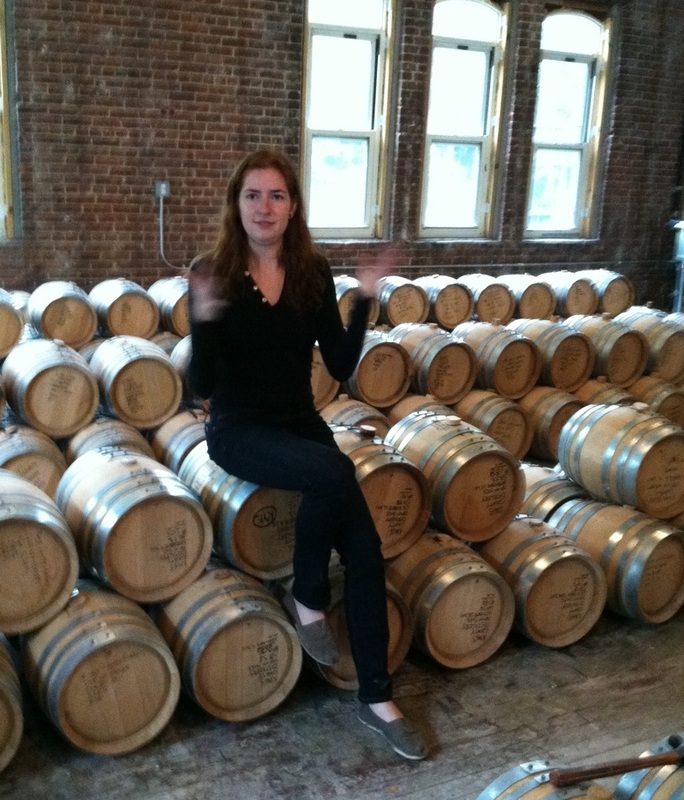 The Kings County Distillery bills itself as New York City’s oldest operating whisky distillery – founded in 2010 by Colin Spoelman and David Haskell, on a porch in Bushwick, and relocated last year to the Navy Yard in Williamsburg. In their new-but-old building (built at the turn of the last century), space is given to a modest wall display of photos. It features readably-large repro’s of historic documents and a lively old-newspaper account of a local battle in the “Whisky Wars” fought not long after the Civil War ended. The federal action on distilleries was not about temperance, it was about taxes; excise taxes, not taxes on income, had funded the Civil War. After the war, the feds wanted to shut down any stills that weren’t paying up. Only after income-based taxation was legislated early in the 20th century could the country afford Prohibition and the loss of revenue from “sin taxes” on booze. The history display is called the Boozeum, and I’m glad to report that the same sense of humor about themselves and their “evolving” whisky-hist’ry show pervades the whole operation and spares it any whiff of pretentiousness. They take themselves lightly, but as a native Kentuckian, Colin Spoelman has maintained from the beginning that they are serious about their bourbon. His home state’s Nelson County is widely considered the beating heart of bourbon country. Last year, with the move to the bigger distillery, Colin gave up his day job with an architecture firm to grow the business. Now, that is being serious. The Mash: Hot water liquifies the starch in corn, then enzymes from sprouting barley seed break down the starches. Bourbon mash is 70% corn, 30% barley. A third partner, Nicole Austin (above), has joined the founders and now oversees operations. She studied chemical engineering in college, though not with this career in mind. “It was kind of like a lightbulb going off,” she says, “I thought, Hey, I bet I know how to make this.” In its early days in Bushwick, the distillery bottled up to 270 liters of corn and barley based whisky a month, less than one tenth of what they now can produce in the Paymaster building. Nicole also conducted the Sunday tour we joined, discussing the progress of distilling from American corn and Scottish barley “mash,” through yeast-processing, batch-testing and tasting, and then aging in the proper new American-oak barrels that must be used if the spirits are to qualify as legitimate bourbon.